As the unbroken tradition goes, this April Facebook held its annual F8 global developer conference. In San Jose, California, the company’s CEO Mark Zuckerberg and others on his team made loads of announcements aimed at developers, laying a lot of stress on augmented reality, virtual reality, and artificial intelligence. We put together all the most exciting tech stuff announced at the conference and tried to figure out what these novelties mean for the world’s developer community. With his purchase of Oculus around three years ago, it was pretty clear that Mark Zuckerberg took VR seriously. His beliefs remain unchanged, as the release of Spaces proves. Spaces is a VR-powered app that lets you (or a cartoonish version of you) hang out with your Facebook friends within your Oculus headset. As of today, there aren’t so many activities to do in Spaces, but the activities that are available are quite fun. For example, you can throw a birthday party and draw 3D stuff to put on your friends or you can take a selfie with a friend and post it on Facebook. Spaces has been launched in beta, and there is still room for growth when it comes to the app’s toolset; at the moment, Facebook places a premium not on what users are going to do in the app but rather on who they’re going to do it with. Spaces is designed to serve as a powerful tool to build stronger relationships between users and their Facebook friends. At its name implies, React VR is a descendant of Facebook’s existing React framework that is used to build web applications. Developers building for VR can now use the same declarative model that they use with React for the web to develop applications with 360-degree experiences. While you can add 3D models using the technology, the main idea is to let developers easily combine their panoramic experiences with 2D user interfaces, texts, and images. To power the experience and provide the interaction between an app and various device sensors, React VR uses existing web technologies like WebGL and WebVR. Presumably, anyone with experience using React should be able to start experimenting with virtual reality pretty easily. Moreover, they may take advantage of existing tools in the React ecosystem. Just as it did with virtual reality several years ago, this year Facebook generated hype around augmented reality. Speaking onstage of F8 2017, Zuckerberg announced that very soon we’ll see our phone cameras initiating new and exciting AR experiences right in Facebook. Soon, Facebook users will be able to use Facebook’s new AR tools to place virtual objects in the real world; these virtual objects will only appear when users view their surroundings through the camera: hidden messages left on your colleague’s desk or colorful advertisements floating on an empty wall on the street. This is possible thanks to a technology called SLAM (simultaneous localization and mapping) that lays a 3D grid over what’s in front of you. “Is it possible to build a similar experience of your own?” a curious developer may ask. Facebook’s answer is “yes.” With the Camera Effects Platform, developers now can create effects for Facebook Camera. There are two creative tools composing the platform that can help them out – Frame Studio and AR Studio. 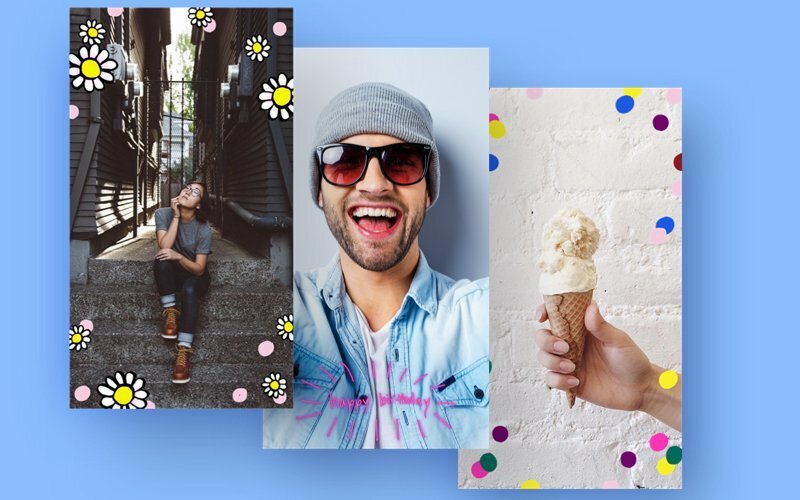 Frame Studio is a web-based tool that lets anyone with a Facebook business page profile create 2D overlays – similar to Snapchat’s geotags – that will appear in the cameras of your friends or page fans. A frame will contain its creator’s name alongside the effect in the camera, but business owners can’t include logos or trademarks. AR Studio enables developers (and artists) to create their own AR experiences, such as 3D animated frames, masks, and other interactive effects that will respond to users’ movements in real time when they’re taking photos or videos or streaming a live broadcast on the social network. The tool is currently in closed beta for Mac. Early adopters of the tool include GIPHY, Manchester United, Nike, Real Madrid, and Warner Bros (Justice League), all of which have used AR Studio to build camera effects that can attract the attention of fans and make them interact with their brands in a new way. Since the rollout of the Messenger platform in Winter 2016, over 100,000 developers have signed up for the Wit.ai bot engine and over 30,000 chatbots have been launched on Messenger. These include interesting examples like the Spotify bot, which plays tunes on demand; the Mastercard bot, which has teamed up with Subway restaurants and lets users pay for food right from Messenger; and the Blackstorm Labs bot, which notifies gamers about big things happening in their game. 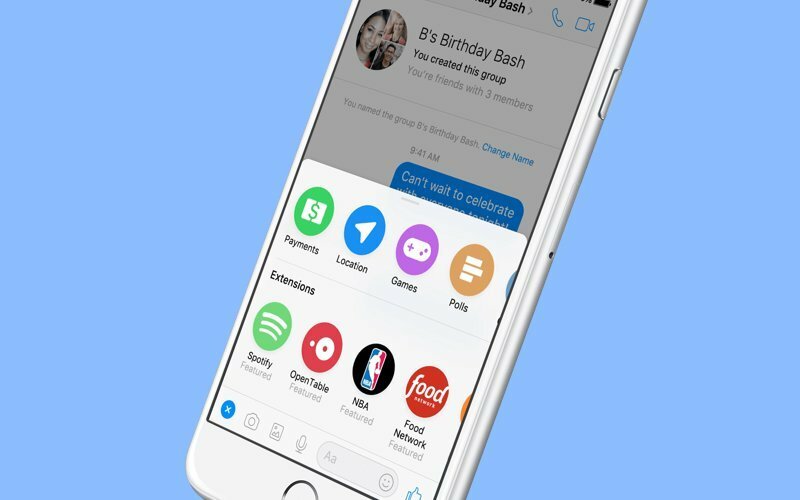 At its latest F8 conference, Facebook introduced an updated version of the Messenger platform, called Messenger Platform 2.0. With its suite of new and exciting tools, developers can now beef up the capabilities of their bots and establish their presence on Messenger. Let’s see what this means. 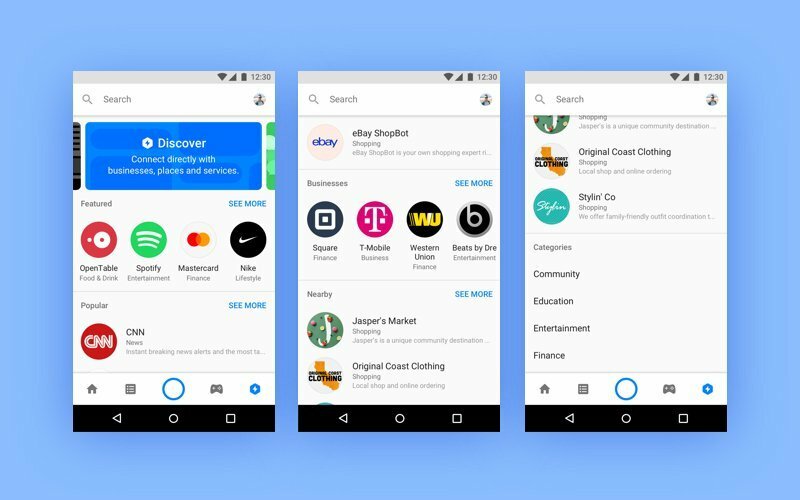 To solve the bot discoverability problem, Facebook introduced its new Discover section that displays trending bots, nearby places, and businesses you can get in touch with. Now you can connect directly to a featured place, businesses, and services to get support and answers to your questions. The Discover section also includes a wide range of categories – Food and Drinks, Entertainment, Finance, and others – to help users find a bot or business in the category they’re looking for. As a developer, you now have the opportunity to expose your product to nearly 2 billion monthly users of the application. If you want to drive more users to your business using the new feature, you need to complete a special Discover submission form in your business page settings. Another feature that may help brands make their presence felt on Messenger is Messenger Codes – basically QR codes – that can be scanned by users to call up a certain bot. Actually, Facebook wants businesses to place Messenger Codes in public places – retail stores, sporting events, concerts, and so on – as a form of customer support. Moreover, vendors can have several chatbots, each for a different purpose. For example, a customer service bot to answer customer questions and a shopping bot to help customers order things. Messenger bots have long been available in the tête-à-tête chat format. But things have changed recently: with Chat Extensions, Facebook now lets bots take part in group chats, meaning that users can invoke chatbots right in their conversations with friends. Using a bot, users can create or select certain content to be shared right in a thread. For example, a group of avid travelers can add a travel bot to their group chat to help them decide where to go on their next vacation; football fans can bring a sports news bot into their conversation to update them on recent scores, big plays, and other interesting stuff about a game –the list of use cases is endless. Speaking of answering questions... In addition to Chat Extensions, Facebook also provides Smart Replies. What are Smart Replies all about? Powered by the Wit.ai bot engine, the Smart Replies technology scans your business page and creates a chatbot that automatically answers basic questions via Messenger – what time your establishment is open today or what your phone number is. In fact, Smart Replies may be a nice tool for a business to start their Messenger experience with. Currently, Facebook is only providing this service to restaurants in the US, but it plans to extend the technology to cover other types of businesses and other countries as well. A majority of developers building for Facebook live and work outside the US, which is why about a year ago Facebook decided to launch a program aimed to unite developers around the world and help them share their knowledge and experience with their fellows. This program is called Developer Circles, and it continues to expand. Developer Circles are forums – offline meetups, workshops, and hackathons – to share knowledge and expertise, build new ideas, and discuss recent technologies announced by Facebook and other industry giants. The program enables all kinds of tech talents – be they students who have just started to master the science of coding or old hands in the tech industry – to improve their skills and get access to the knowledge they need. Every local Circle has its own lead who can arrange offline events to make knowledge sharing inside a local community possible. Plus, every Circle can have a dedicated Facebook group to continue communication between meetups. In a Circle’s Facebook group, members can share code, links, educational videos, and other stuff they’ve already been sharing on Facebook. In addition to getting new knowledge on meetups and workshops, developers can also take different educational programs. Partnering with Udacity, Facebook has launched a selection of training programs for the community that are available on the company’s website, in your Circle group, and on Udacity. As always, Facebook brings the future a bit closer to us. This year’s announcements will undeniably have a powerful effect on numerous businesses that have already joined the platform as well as on those that are only considering giving it a go. We can’t wait to have hands-on experience with all the announced tools and to see the first fruits they will bring.